CONTRARY to perception, seven-seat SUVs aren't driven by penniless parents with oversized families. 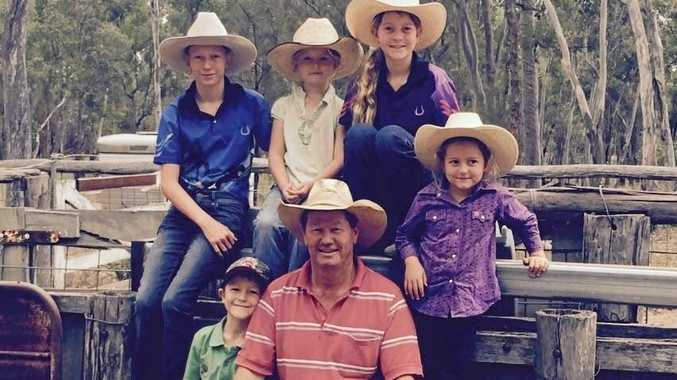 The average seven-seater buyer has only two or three children and mainly gravitates to the most expensive model in the range. Hyundai says many people don't blink at spending $60,000 to $70,000 on a new SUV. 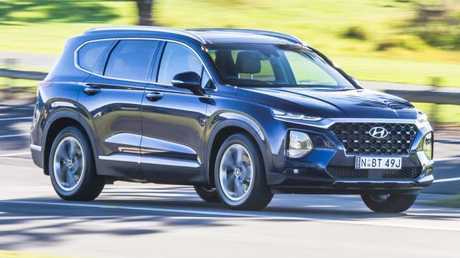 It predicts the top-of-the-range Highlander will be the most popular choice for its new Santa Fe, accounting for roughly 35 per cent of sales. So we've chosen to toss the Highlander into one of the toughest comparison tests in recent memory. Taking on the new Santa Fe is our reigning 2017 Car of the Year, Skoda's Kodiaq, and the updated version of our 2015 Car of the Year, the Kia Sorento. All are diesel, all-wheel drive and circa $65,000 on the road. 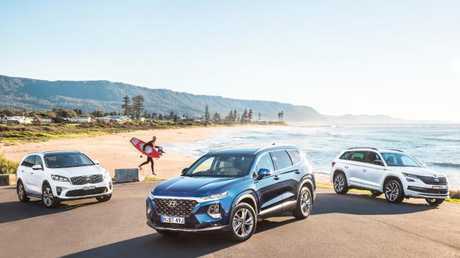 The new Santa Fe has grown slightly, liberating more space for second-row passengers and making access to the third row easier. It's still not as big as the Toyota Kluger or Mazda CX-9. Apple CarPlay and Android Auto are standard, there's a wireless inductive charger for compatible smartphones and you can turn on the engine and aircon/heating remotely via an app on your phone - it will also tell you where you parked your car. There's also an abundance of USB ports and 12V outlets for the kids' portable devices. The Santa Fe comes with a new all-wheel drive set-up that allows you to adjust the bias from front to back at the press of a button. In sport mode, more drive is sent to the rear, in economy mode it's front drive to save fuel. It doesn't get some of the more advanced safety gear of its sibling, most notably cyclist detection and the ability to slam on the brakes when reversing if it senses an obstacle behind the car. 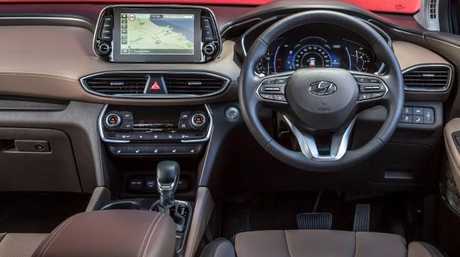 The cabin is well put together and it mimics the Santa Fe's heated seats and aircon vents with fan speed control in the rearmost pews. As with the Hyundai, the airbags don't extend all the way to the back of the car. 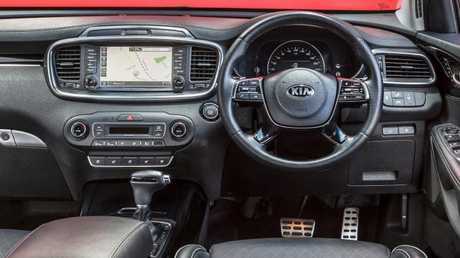 The Kia trumps the Hyundai and Skoda with a seven-year unlimited kilometre warranty to the others' five. 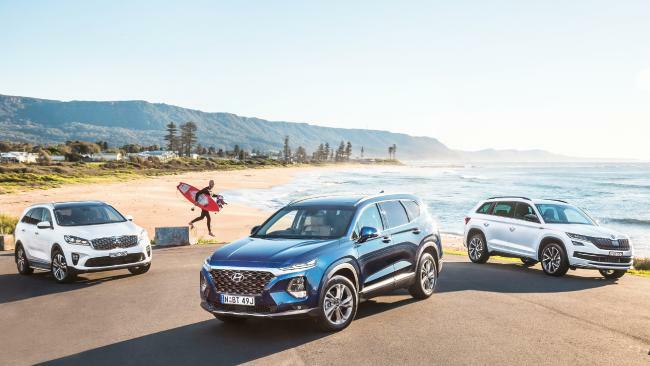 Access to the rearmost seats is tighter than the Santa Fe and doesn't have the convenience of a one-touch slide and fold mechanism but, once in place, passengers will find similar headroom and kneeroom. 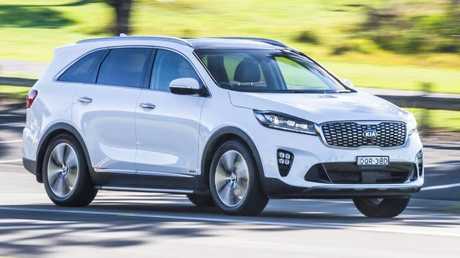 The Sorento doesn't feel as sporty as the other two through the corners but provides excellent comfort combined with safe and predictable handling. Noise suppression isn't quite as good as the other two, though, and the steering isn't as sharp. 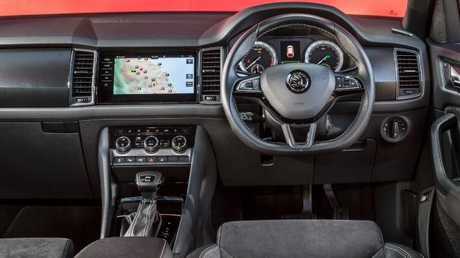 The Kodiaq's cabin oozes quality and class, with stitched Alcantara and leather seats, a sporty flat-bottom steering wheel, carbon-fibre inserts in the doors and on the dash and a razor- sharp centre touchscreen. Then there are the clever Skoda touches including umbrellas in the front doors, detachable torch in the rear and waste bin in the driver's door. 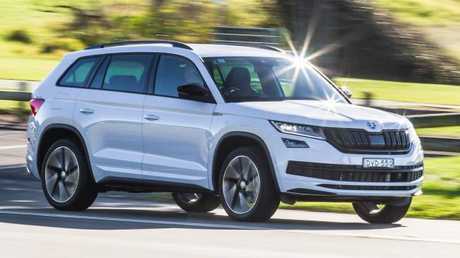 The Kodiaq is a little down on power and torque compared with the Korean pair but you don't notice behind the wheel because it is considerably lighter. That translates to a handy fuel economy advantage - more than 20 per cent better on the official test cycle - and an advantage on the road. It feels more nimble than the other two through corners, although it can be a bit jittery at times over corrugations. Compact dimensions also mean there's noticeably less space for third-row passengers. You can slide the second row forward for more space but it is still a young kids-only zone and access to the third row is a bit fiddly. These comprise the cream of the seven-seat SUV crop and none will disappoint. The Sorento wins points for its longer warranty but can't match the others for tech and up-market feel. 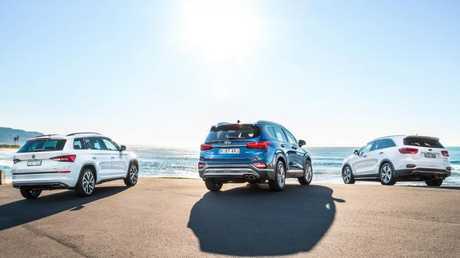 The Kodiaq is a great drive with a beautifully appointed cabin but the Santa Fe narrowly takes this contest thanks to greater safety and comfort tech and more space for the price.